September 30th at even begins the Feast of Trumpets! Tags: bible, Day of Atonement, elder Yachov ben israel, Feast of Tabernacles, Feast of Trumpet, Halleluyah, Hebrew Israelite, NCCI, new moon, Tabernacles, ten commandments, Yahshua, Yahweh, YHWH | Permalink. Pondering on the Fall Holy Days…. 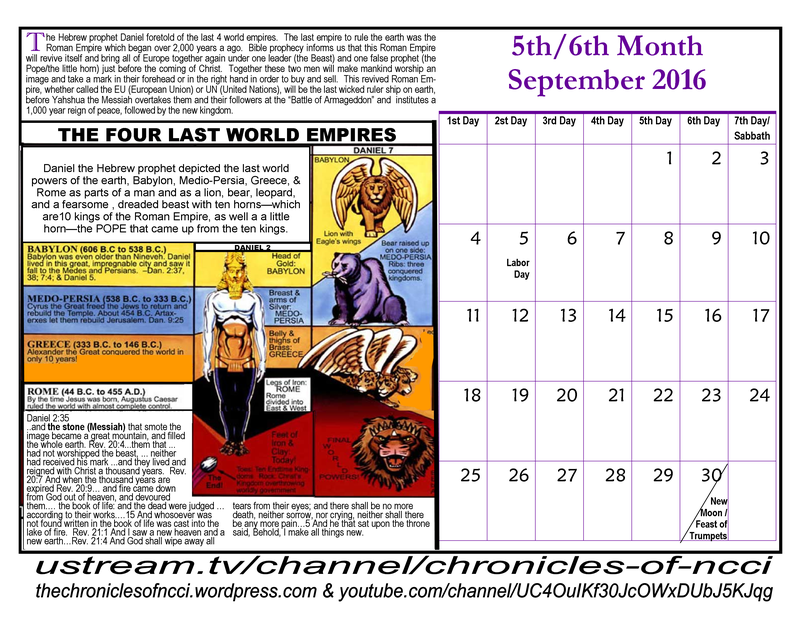 The fall Holy Days, just like all the Holy Days represent history as well as prophesy. The prophesy portion of the fall Holy Days speak of the the return of the Messiah and the His Millennial reign on earth. The DAY OF ATONEMENT is the day that the Messiah, (the stone-Dan 2:34) returns and brings down all corruption. The FEAST OF TABERNACLES represents the Millennial Kingdom over which the Messiah will reign. 31 … O king … behold a great image …. 32 This image’s head was of fine gold, his breast and his arms of silver, his belly and his thighs of brass, 33 His legs of iron, his feet part of iron and part of clay. 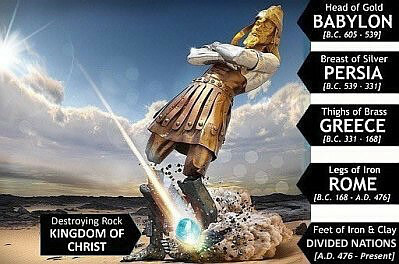 34 Thou sawest … a stone was cut out without hands, [the Messiah] which smote the image [the last world powers] upon his feet … and brake them to pieces. 35 … and the stone that smote the image became a great mountain, and filled the whole earth. 38 … Thou art this head of gold. [Babylonian Empire] 39 And after thee shall arise another kingdom inferior to thee [Medo-Persian], and another third kingdom of brass [Grecian] , which shall bear rule over all the earth. 45 … the stone … brake in pieces the [Empires] iron, the brass, the clay, the silver, and the gold … the dream is certain, and the interpretation thereof sure. 47 The king answered unto Daniel, and said, Of a truth it is, that your God is a God of gods, … and a revealer of secrets, seeing thou couldest reveal this secret. Tags: Day of Atonement, elder Yachov ben israel, Feast of Tabernacles, Feast of Trumpet, Halleluyah, Hebrew Israelite, NCCI, Tabernacles, Yahshua, Yahweh, YHWH | Permalink. What REALLY happens when the Messiah Returns? Do we all float off, like in the book and TV series “Left Behind”? 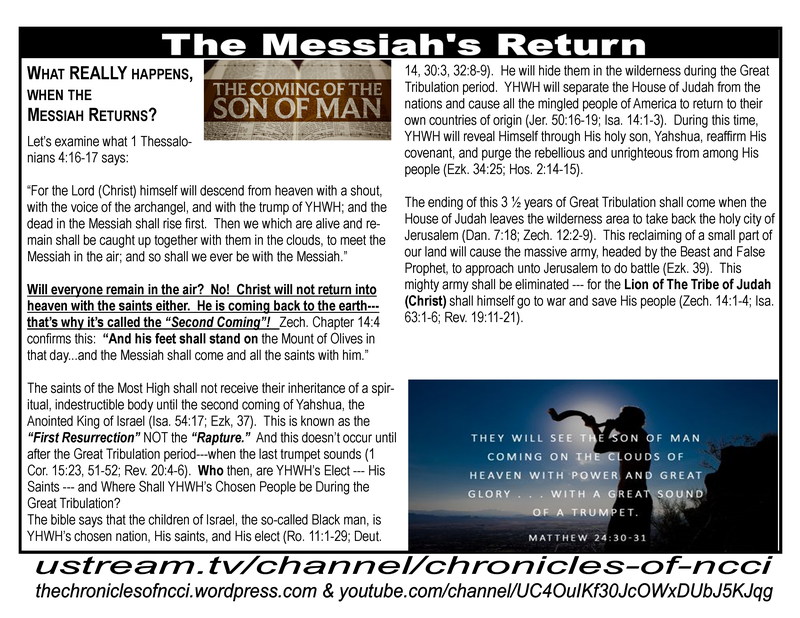 Tags: bible, blacks, Day of Atonement, elder Yachov ben israel, Feast of Tabernacles, Feast of Trumpet, First Resurrection, Halleluyah, Hebrew Israelite, NCCI, rapture, return of Messiah, ten commandments, Yahshua, Yahweh, YHWH | Permalink. This New Moon Class focuses on the the Return of the Messiah—— just like the focus of the Fall Holy Days. Tags: Day of Atonement, elder Yachov ben israel, Feast of Tabernacles, Feast of Trumpet, Halleluyah, Hebrew Israelite, NCCI, new moon, Tabernacles, Yahshua, Yahweh, YHWH | Permalink.